Our 12th year of traveling has come to an end. We've been to all the US states and five Canadian provinces, visited 308 RV parks, 106 Elks lodges and taken 86,000 photos. However, "We ain't see nothing yet!" It has been an awesome blessing to be able to travel 119,295 miles and meet thousands of people. As you can see, we have pulverized California and much of the West. We've done the Midwest justice but only scratched the surface of the Eastern States (7 month scratch). Many we have met are amazed that we have been traveling full time for 12 years. We are not amazed. We met "Craig", our first mentor, on day two. He and his wife were full timers for 12 years in 2006. Pete met a couple in January 2016 who were on their 27th year! A very common question is "What is your favorite place?". The answer is always "the people". 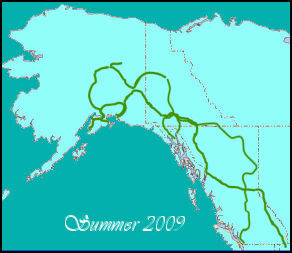 If we have to pick a place, it is Alaska, a fabulous summertime adventure. Life in the frontier as it was 50 years ago in the lower 48. Majestic scenery and wildlife and every photo could be a post card or picture puzzle. Now, back to the people. Out of the thousands we have met, we must have at least a hundred great stories we repeat. Amazing Hospitality: We met Charlie and Cheryl at the Las Vegas Outdoor Resorts in May 2006. Ellen met them in the afternoon. Pete came home from a basketball clinic at 10pm. Coming back from the spa at 11pm and opening the door, a voice called out. "Ellen, is that you?". "Yes, Charlie, its me." Charlie replied, "Bring Pete over we want to meet him." We spent three hours with Charlie and Cheryl saying goodnight at 2am. The next morning before they left, Cheryl brought us their Georgia address and phone number and told us to visit. One year later we were in Georgia near Charlie and Cheryl. Pete called Cheryl, "Hi, this is Pete". "Pete, Pete from Las Vegas?". "Yes". "Are you here?" "We are near you but Ellen is not feeling well." "That's okay, I know where you are." Cheryl proceeded to tell us to come over and stop at a doctor that had room to park the MotherShip. We did and getting to their house, they parked us on their lawn with 30 amp power and water. We stayed for a week and they would not let us pay for anything. 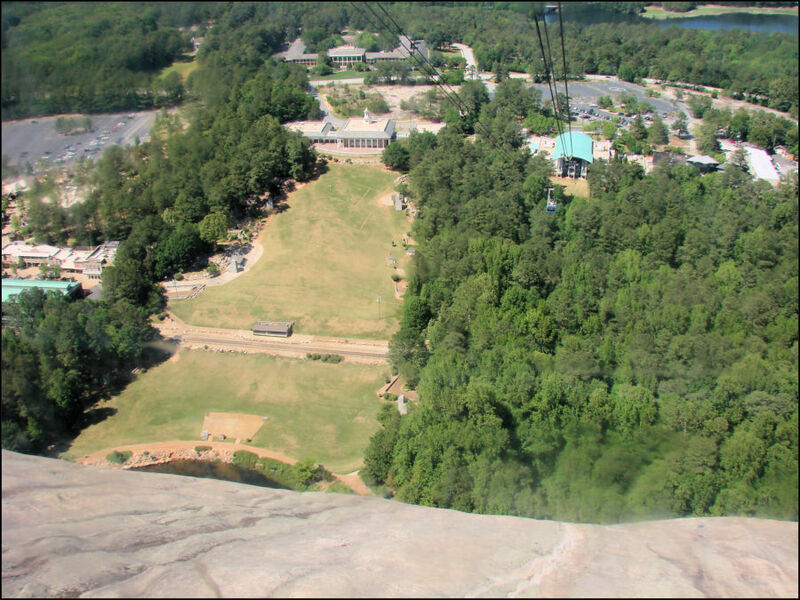 We visited Stone Mountain Park. It contains the largest piece of exposed granite in the world. The relief carving of Jefferson Davis, Robert E. Lee and Stonewall Jackson was carved by Gutzon Borglum, the sculptor of Mount Rushmore. Charlie asked if we wanted to take the tram to the top of the mountain. We noticed it was $27 per person, so we declined. Having none of this Charlie paid for the four of us to ride to the top. Truly, there is nothing like southern hospitality. When we told them we are leaving their home after staying two weeks, they were understanding but disappointed. Great Comradery: This happens at every RV park, but was instant when we visited Ozarks Luxury RV Resort on Table Rock Lake. 1) Kevin asked us and the ScooterShip to join his Harley group for a ride. A very long ride. 2) At night we joined Kevin and others for a fireside chat. It happened to be the night that Hurricane Ike crawled its way up to Northern Arkansas. While no longer a hurricane it downed hundreds of trees and cut off a lot of power. We told our hosts we had to leave the park as we foolishly let our diesel drop below 1/4 tank. The generator will not work when fuel is that low. 1) Kevin, Paul and Cara said "no problem". If you need fuel we'll drive to the station and bring back the diesel you need. We declined their generosity and said we still felt we needed to leave. They then proposed "Please stay and we'll load the boats up tomorrow and power our way to Branson, Missouri for lunch. Then will you stay?." 2) "Okay", we stayed and a dozen friends in two boats enjoyed the beautiful weather on Table Rock Lake. Incredible Generosity: In 2011 we needed to have our diesel engine rebuilt. We pulled into the Louisville Elks Lodge #8 and asked where to park. "Pick a spot on the lawn!" Then they hooked up a 100 foot long 30 amp power cord to the MotherShip. We spent a few days at the Louisville, Kentucky Elks. The members told our sad story of a blown engine to every person who entered the lodge. The repair would start soon and take 10 days. "Duck" (Don) came in, sat down next to Ellen and in a couple of minutes offered us his house to stay in during the repair. "Or, I have a 40 foot two bedroom yacht in a harbor on the Ohio River". Ellen chose the yacht. We spent a wonderful week on the yacht, dining at several great and inexpensive restaurants on the river. Friends for the Day: We move a lot and enjoy it. But that does not stop us from meeting good friends. Many times we have met someone who invites us to visit their home in the MotherShip. In April 2007, we met Hank and Anne in Carrabelle, Florida. They are from Ontario, Canada. As we were intrigued by the Smart Car, Hank let us drive it. RV Traveling Friends Forever: Yes, our favorite place is "the people". And there are so many, so don't be offended as we list just a few, that we have been with to a lot of places. Ben and Sid, Atascadero Neighbors: After talking about an hour per year over the fence in Atascadero we both hit the road. On our first meeting we spent more time in one day then we did the 13 years as neighbors. We have been to motorhome rallies; Mount Olympus, Washington; Vancouver Island BC; Niagara Falls, Indiana Amish Country; Yuma, Arizona; Port Angeles, Washington; Atascadero Elks; Blanchard, Idaho; as well as a dozen days in the Phoenix/Surprise Area. Gordon and Karen: We met them at the 1st Annual Mission Hills pickleball tournament. We saw them here and there until we spent two weeks cruising the Grand Canyon North Rim; Flagstaff, Arizona; Camp Verde, AZ; Happy Trails, Surprise AZ; Yuma, AZ and Algodones, Mexico for dental work. Since then we have seen them in Bend, Oregon; Coeur d'Alene, Idaho; Indio, CA (their winter home); St. George, Utah; Petaluma, CA; Atascadero Elks and at various pickleball tournaments as partners or not. Clint and Jackie: We met online! No, not a dating service, but a pickleball partner match service. We partnered up in men's doubles 3.5 at the 1st Mission Hills pickleball tournament. We told Clint we would meet up to practice after we found a place to park in the Palm Springs area. Clint said they lived in a gated community and we could park in front of their house. We had tried this before and were told it was not allowed. Clint replied "don't worry, it will be okay." We did go to their house and learned they lived in a four-house gated cul de sac and all was okay. We have stayed next to their lovely home more than five weeks in a dozen stays. This story also merits being the "hospitality" section. Graciously, they have allowed us to help a little at their summer home in Washington. 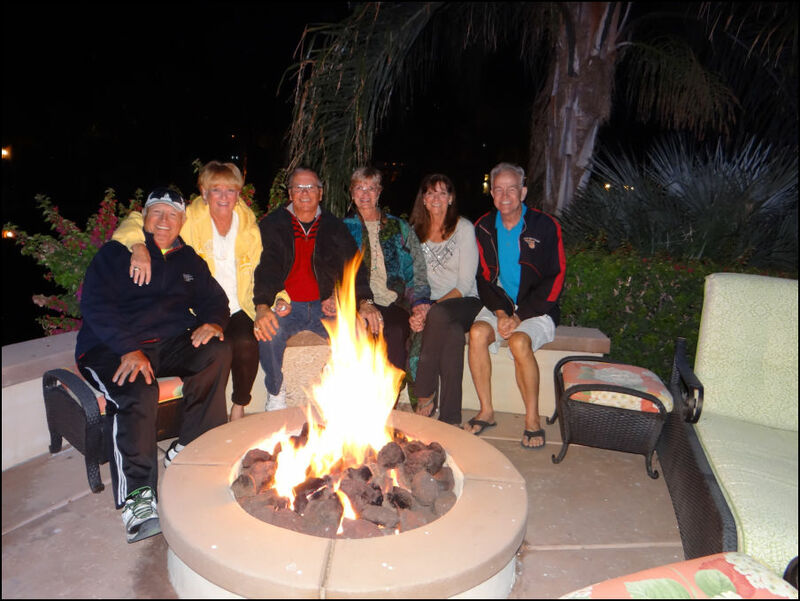 We were blessed to give back a little to our friends by inviting them to Motorcoach Country Club in Indio. We had a three-day stay for which the daily rates were well over $100 per day. Nice to try once. We continue to meet wonderful people on the road. More recently we met Tim and Vikki, full time travelers whom we first met at Golden Village Palms in Hemet, CA. 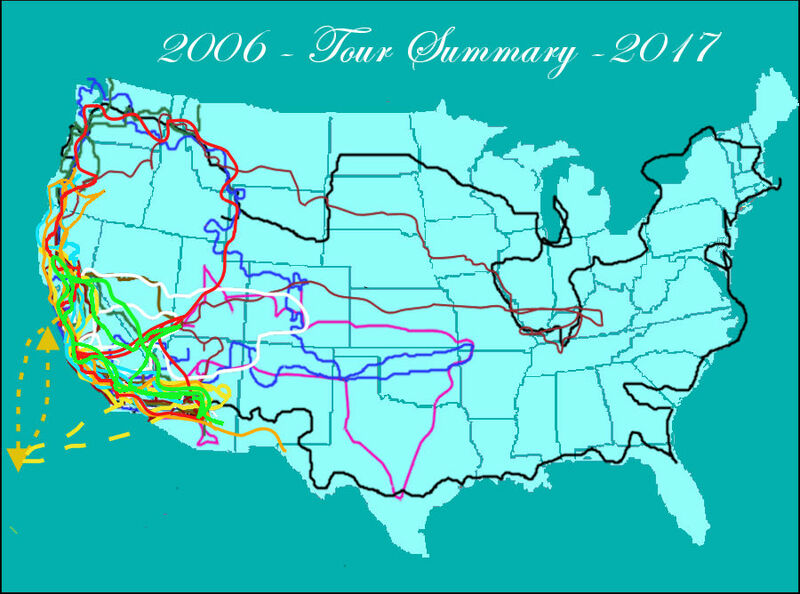 Since then we have seen the in Red Bluff, CA; Yuma, AZ; West Covina, CA; and in Atascadero twice. They even came to our house to help with our remodel. We'll be seeing them soon in Indio, Hemet and wherever else we can. Mandy also enjoys the "people". She doesn't discriminate. She likes Sam the Dog, BuTu the Cat, Hannie the Kid and is considering other friendships. As we look forward to 2018, we wish for all our family and friends, a blessing from the Lord and a wonderful and Happy New Year. P.S. Many also ask, "How long are you going to continue to travel?"